When Ruchi Mehta, Ph.D. ’00, molecular and cellular biology, arrived on the College Park campus from India to begin her graduate studies in 1995, she had $300 in savings. “It was not a huge financial cushion to fall back on,” recalls Ruchi, who joined her future husband, Amit Mehta, MBA ’96, business and management, in pursuing an advanced degree from University of Maryland. While pursuing her Ph.D., Ruchi worked as a resident advisor and as a teaching assistant for Biochemistry Professor Jason Kahn, her doctoral adviser, to support herself. She soon realized that while she loved science, she wanted to explore other ways to use her knowledge. With a few business electives under her belt and in-depth research of the health care investing world, Ruchi looked to Wall Street when she completed her degree and was soon hired by what would become one of the largest hedge funds in the world. “It was a risky choice, but a fascinating one. With my science background, I knew how to read and interpret data and use that information to make investment decisions,” describes Ruchi, who eventually managed the health care segment of the firm, analyzing biotechnology, pharmaceutical and medical device companies, among others. Today, Ruchi spends much of her time volunteering at the school her two young children attend, but Amit remains committed to the hedge fund industry, co-managing his own firm. The Mehtas are quick to acknowledge the role UMD has played in their success. “The skill sets we acquired and the motivation to work hard and do well was, in part, learned at the University of Maryland,” notes Ruchi. Now, the Mehtas are giving others the opportunity to learn those important lessons. The Mehta Graduate Research Award supports graduate students in the College of Computer, Mathematical, and Natural Sciences with international experience who want to serve the broader global community when they graduate. “We want to provide a safeguard for international students if other means of funding fall through the cracks,” explains Ruchi. 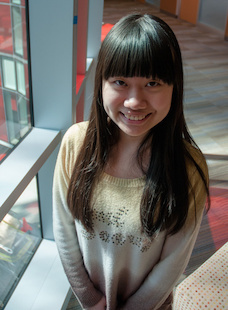 Biochemistry graduate student Yue Zheng, who left China to continue her education at UMD, is thrilled to be the first recipient of the award. “The award is gratifying because it recognizes my hard work during the past few years,” says Zheng, who is interested in discovering new antibiotics to combat disease. The Mehtas are looking to create a wider circle of philanthropy through their award. “We hope the recipients of our award will want to give back when they are able. We would love for other alumni and friends to find ways they can give back as well. UMD deserves it,” says Ruchi.